By Luke J. Ballard, M.D. and Geneva R. Ballard M.D. Ductal carcinoma in situ (DCIS) is a common pre-invasive malignancy of the breast, representing approximately 20% of all breast cancer diagnoses.12 It is widely believed that DCIS is a precursor lesion to invasive ductal carcinoma, but the exact biologic nature is not completely understood and debated by some.3-5 DCIS is unarguably a heterogeneous disease with variable malignant potential. Evidence shows that high-grade DCIS is an aggressive subtype with an overall poorer prognosis than non-high-grade disease. There have been many studies evaluating the role of the radiologist in the diagnosis of high-grade DCIS with emphasis on radiologic-pathologic correlation using standard mammography and magnetic resonance imaging. Our current understanding of the clinical importance of high-grade DCIS from the perspective of a radiologist and characteristic imaging features are discussed in detail. Autopsy studies suggest that a substantial number of DCIS cases may remain subclinical, although the interpretation and significance of these findings is debated.12,13 Papers such as these underscore the concept that some DCIS is effectively benign, but it remains evident that there is no way to prospectively determine if and when DCIS will progress to invasive disease. Moreover, the available data are not representative of the full spectrum of DCIS and largely exclude high-grade lesions. High-grade DCIS is rarely misdiagnosed pathologically and is routinely surgically excised, owing to the perceived malignant potential. This has allowed for very limited long-term observations. High-grade DCIS represents the majority of screening detected in situ lesions in multiple series, further emphasizing the importance of this diagnosis.27-29 Diagnosing high-grade DCIS represents a relatively frequent opportunity for radiologists to impact patient care. Thorough knowledge of the characteristic imaging features of high-grade DCIS, as well as the limitations of imaging, is imperative. Many studies have demonstrated a correlation between the type of mammographic calcification and the pathologic diagnosis, suggesting that certain calcification types are more likely to be associated with high-grade lesions at histopathology. 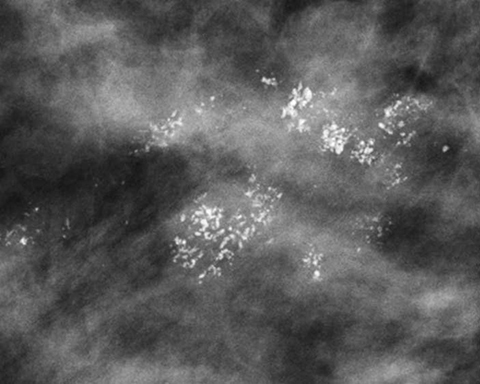 Specifically, linear branching calcifications are generally predictive of high-grade DCIS (Figure 1)21,36-38 These result from extensive intraluminal necrosis and calcifications which form “casts” of the ducts, yielding the characteristic linear branching pattern. A variety of mammographic descriptors have been used that with nuanced differences appear to be synonymous to linear branching calcifications, including “fine linear branching,” “casting,” and “comedo” calcification. The range of non-standardized microcalcification descriptors in the literature may indicate a measure of subjectivity in the analysis, although generally the differences can be reconciled. 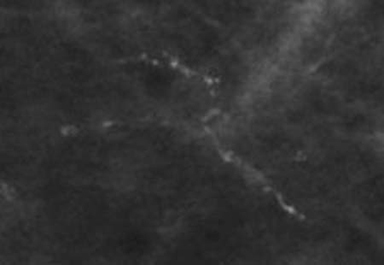 While linear branching calcifications are characteristic of high-grade DCIS, the significance of this finding as a histologic predictor of disease is debated. High-grade DCIS appears to present with this finding in a majority of cases. In one study by Lee et al., 15 of 16 high-grade DCIS lesions presented with linear calcifications and showed excellent correlation.36 In another study by Dinkel et al., 14 of 18 high-grade DCIS lesions showed linear calcifications. 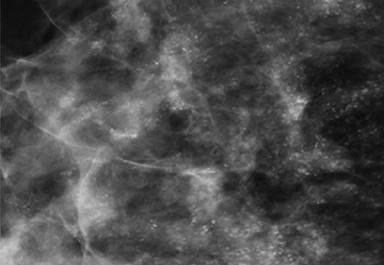 This pattern represented high-grade DCIS 56% of the time. Though this is the majority, compared with intermediate and low-grade DCIS, this was not a statistically significant result. 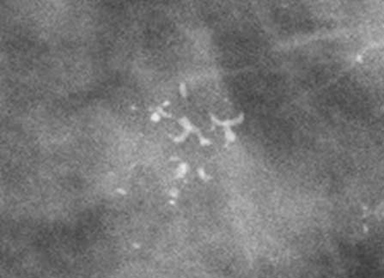 The remaining 32% and 12% of linear calcifications represented intermediate and low-grade DCIS, respectively.39 First evaluated by Tabar et al., multiple studies have provided evidence that casting calcifications import a poor prognosis when associated with small invasive cancers.3,40,41 Analysis shows that these casting calcifications consistently represent the presence of extensive high-grade DCIS (Figure 2). 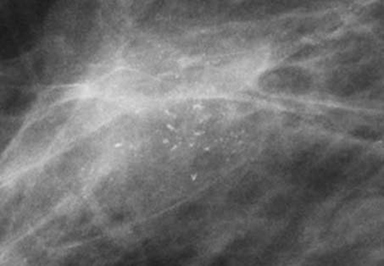 When not calcified, DCIS presents in numerous ways on mammograms, including masses, asymmetries, architectural distortion, and even as a negative exam.32 DCIS may present as a mass, either palpable or screen detected in up to 10% of cases of DCIS; this presentation is seen more commonly in low-grade lesions, rather than high-grade DCIS.42,43 Presentation as a focal asymmetry may be especially challenging to radiologists when the finding is questionable, not seen with ultrasound, or difficult to localize stereotactically. 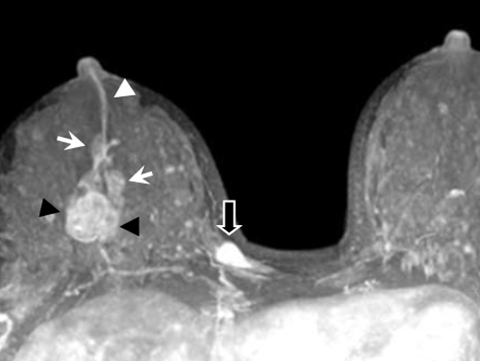 Moreover, a negative mammogram may harbor DCIS, as demonstrated by occult cases identified only with the use of MRI. While such presentations are less common, it remains important to be aware that high grade DCIS may present as a non-calcified mammographic abnormality. The kinetic characteristics of pure DCIS lesions are more heterogenous and less predictive than those of invasive cancers, which are more likely to demonstrate early enhancement followed by rapid washout kinetics. The majority of pure DCIS lesions have rapid initial phase of enhancement in up to 77% of cases.46,48,50 The type of delayed enhancement is variably reported, but most commonly described as plateau or washout. Less often, DCIS lesions may demonstrate slow, progressive delayed enhancement (Figure 5). As with enhancing masses, a suspicious morphology, such as unilateral segmental or linear enhancement, will trump an associated benign appearing dynamic enhancement curve. Overall, pure DCIS has an excellent prognosis; however, high-grade DCIS is an aggressive subtype with significantly greater morbidity and risk of mortality with recurrent invasive disease. Appropriate use of mammography and MRI affords radiologists an opportunity to identify this population and guide the most appropriate surgical and oncologic management based upon our current understanding of the disease. Research has extensively evaluated mammographic and MRI features of high-grade DCIS, and its appearances are well documented. Unfortunately, imaging currently shows little prospective value in cases of pure high-grade DCIS beyond the ability to make the initial diagnosis. Future research is necessary to determine the full impact of imaging patients with high-grade disease and to further define the best clinical treatment strategies. The views expressed in this material are those ofthe author, and do not reflect the official policy or position of the U.S. Government, the Department of Defense, or the Department of the Air Force. Virnig BA, Tuttle TM, Shamliyan T, et al. Ductal Carcinoma In Situ of the Breast: A Systematic Review of Incidence, Treatment, and Outcomes. J Natl Cancer Inst 2010;102:170- 178. Brinton LA, Sherman ME, Carreon JD, et al. Recent Trends in Breast Cancer Among Younger Women in the United States. J Natl Cancer Inst 2008;100:1643-1648. Sanders ME, Schuyler PA, Dupont WD, et al. The Natural History of Low-Grade Ductal Carcinoma in Situ of the Breast in Women Treated by Biopsy Only Revealed Over 30 Years of Long-Term Follow-Up. Cancer 2005;103:2481-4. Erbas B, Provenzano E, Armes J, et al. The natural history of ductal carcinoma in situ of the breast: a review. Breast Cancer Res Treat 2006;97:135-144. Espina V, Liotta LA. What is the malignant nature of human ductal carcinoma in situ? Nat Rev Cancer 2011;11:68-75. Cady B, Chung MA. Preventing Invasive Breast Cancer. Cancer 2011Jul15;117(14):3064-8. Welch GH, Woloshin S, Schwartz LM. The sea of uncertainty surrounding ductal carcinoma in situ-the price of screening mammography. J Natl Cancer lnst2008;100:228-9. Tabar L, Vitak B, Chen TH, Yen AM, et al. Swedish two-county trial: impact of mammographic screening on breast cancer mortality during 3 decades. Radiology. 2011Sep; 260(3):658-63. Epub 2011 Jun 28. Hellquist BN, Duffy SW, Abdsaleh S, et al. Effectiveness of population-based service screening with mammography for women ages 40 to 49 years: evaluation of the Swedish Mammography Screening in Young Women (SCRY) cohort. Cancer. 2011 Feb 15;117(4):714-22. Epub 2010 Sep 29. Kopans DB, Smith RA, Duffy SW. Mammographic Screening and "Overdiagnosis". Radiology 2011;260: 616-620. Jorgensen KJ, Keen JD, Gotzsche PC. Is Mammographic Screening Justifiable Considering Its Substantial Overdiagnosis and Minor Effect on Mortality? Radiology 2011;260:621-627. Welch HG, Black WC. Using Autopsy Series To Estimate the Disease "Reservoir" for Ductal Carcinoma in Situ of the Breast: How Much More Breast Cancer Can We Find? Ann Intern Med 1997;127:1023-1028. Kopans DB, Rafferty E, Georgian-Smith D, et al. A Simple Model of Breast Carcinoma Growth May Provide Explanations for Observations of Apparently Complex Phenomena. Cancer 2003;97:2951-2959. Ernster VL, Barclay J, Kerlikowske K, et al. Mortality Among Women With Ductal Carcinoma In Situ of the Breast in the Population-Based Surveillance, Epidemiology andEnd Results Program. Arch Intern Med 2000;160:953-958. Zujewski JA, Harlan LC, Morrell DM, et al. Ductal carcinoma in situ: trends in treatment over time in the US. Breast Cancer Res Treat 2011;127:251-257. Schwartz GF, Salin LJ, Olivotto IA, et al. Consensus Conference of the Treatment of In Situ Ductal Carcinoma of the Breast, April 22-25, 1999. Cancer 2000;88:946-954. Lee LA, Silverstein MJ, Chung CT, et al. Breast cancer-specific mortality after invasive local recurrence in patients with ductal carcinoma-in-situ of the breast. Am J Su rg 2006;192:416-419. Romero L, Klein L, Ye W, et al. 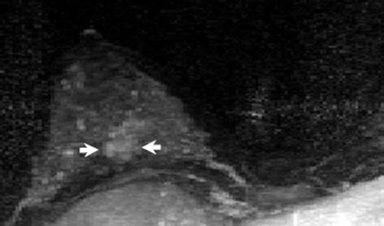 Outcome after invasive recurrence in patients with ductal carcinoma in situ of the breast. Am J Surg 2004;188:371-376. Silverstein MJ, Barth A, Poller DN, et al. Prognostic classification of breast DCIS; Ten-year results comparing mastectomy to excision and radiation therapy for ductal carcinoma in situ of the breast. European Journal of Cancer 1995; 31:1425-7. Silverstein MJ, Poller DN, Waisman JR, et al. Prognostic classification of breast ductal carcinoma-in-situ. Lancet 1995;345:1154-57. >Lagios MD, Margolin FR, Westdahl PR, et al. Mammographically detected duct carcinoma in situ. Frequency of local recurrence following tylectomy and prognostic effect of nuclear grade on local recurrence. Cancer 1989;63:619-24. Bijker N, Meijnen P, Peterse JL, et al. Breast-conserving treatment with or without radiotherapy in ductal carcinoma in-situ: ten-year results of European Organisation for Research and Treatment of Cancer randomized phase Ill trial 10853--a study by the EORTC Breast Cancer Cooperative Group and EORTC Radiotherapy Group. J Clin Oneal 2006; 24:3381-7. Hetelekidis S, Collins L, Silver B, et al. Predictors of local recurrence following excision alone for ductal carcinoma in situ. Cancer 1999; 85(2):427-31. Holmes P, Lloyd J, Chervoneval, et al. Prognostic markers and long-term outcomes in ductal carcinoma in situ of the breast treated with excision alone. Cancer 2011;117:3650-7. Schnitt SJ. Local outcomes in ductal carcinoma in situ based on patient and tumor characteristics. J Natl Cancer Inst Monogr 2010;2010:158-61. Brennan ME, Turner RM, Ciatto S, et al. Ductal carcinoma in situ at core-needle biopsy: meta-analysis of underestimation and predictors of invasive breast cancer. Radiology 2011;260:119-28. Evans AJ, Pinder SE, Ellis 1 0, et al. Screen detected ductal carcinoma in situ (DCIS): overdiagnosis or an obligate precursor of invasive disease? J Med Screen 2001;8:149-51. Kessar P, Perry N, Vinnicombe SJ, et al How significant is detection of ductal carcinoma in situ in a breast screening programme? Clin Radial 2002;57:807-14. Kricker A, Goumas C, Armstrong B. Ductal carcinoma in situ of the breast, a population-based study of epidemiology and pathology. Br J Cancer 2004;90:1382-5. Barreau B, de Mascarel I, Feuga C, et al. Mammography of ductal carcinoma in situ of the breast: review of 909 cases with radiographic-pathologic correlations. Eur J Radial 2005;54:55-61. Stamper PC, Connolly JL, Meyer JE, et al. Clinically occult ductal carcinoma in situ detected with mammography: analysis of 100 cases with radiologic-pathologi c correlation. Radiology 1989;172:235-41. Ikeda DM, Anderson I. Ductal Carcinoma in Situ: Atypical Mammographic Appearances. Radiology 1989; 172: 661-666. Ciatto S, Cataliotti L, Distante V. Nonpalpable lesions detected with mammography: review of 512 consecutive cases. Radiology 1987;165:99-102. Hall FM, Storella JM, Silverstone DZ, at al. Nonpalpable breast lesions: recommendations for biopsy based on suspicion of carcinoma at mammography. Radiology 1988;167:353-8. Egan RL, Mcsweeney MB, Sewell CW. lntramammary calcifications without an associated mass in benign and malignant diseases. Radiology 1980;137:1-7. Lee KS, Han BH, Chun YK, at al. Correlation between mammographic manifestations and averaged histopathologic nuclear grade using prognosis-predict scoring system for the prognosis of ductal carcinoma in situ. Clin Imaging 1999;23:339-46. Holland R, Hendriks JH. Microcalcifications associated with ductal carcinoma in situ: mammographic-pathologic correlation. Semin Diagn Pathol 1994;11:181-192. Tabar L, Tony Chen HH, Amy Yen MF, et al. 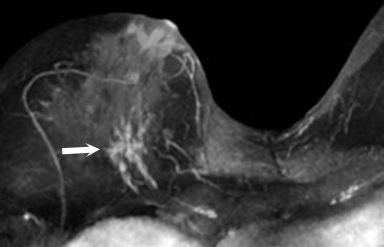 Mammograph ic tumor features can predict long-term outcomes reliably in women with 1-14-mm invasive breast carcinoma. Cancer 2004; 101:1745-59. Dinkel HP, Gassel AM, Tschammler A. 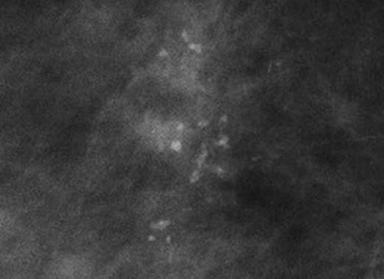 Is the appearance of microcalcifications on mammography useful in predicting histological grade of malignancy in ductal cancer in situ? Br J Radio I 2000;73:938-44. Zunzunegui RG, Chung MA, Oruwari J, et al. 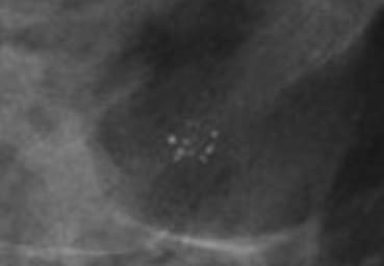 Casting-type calcifications with invasion and high-grade ductal carcinoma in situ: a more aggressive disease? Arch Surg 2003;138: 537-40. Palka I, Ormandi K, Gaal S, et al. Casting-type calcifications on the mammogram suggest a higher probability of early relapse and death among high-risk breast cancer patients. Acta Oncol 2007;46:1178-83. Evans A, Pinder S, Wilson R, et al. Ductal carcinoma in situ of the breast: correlation between mammographic and pathologic findings. Am J Roentgenol 1994;162:1307-11. Yang WT, Tse GM. Sonographic, mammographic, and histopathologic correlation of symptomatic ductal carcinoma in situ. Am J Roentgenol 2004;182:101-10. Yamada T, Mori N, Watanabe M, et al. Radiologic-pathologic correlation of ductal carcinoma in situ. Radiographies 2010;30:1183-98. Kuhl CK, Schrading S, Bieling HB, et al. MRI for diagnosis of pure ductal carcinoma in situ: a prospective observational study. Lancet 2007;370:485-92. Kim JA, Son EJ, Youk JH, et al. MRI findings of pure ductal carcinoma in situ: kinetic characteristics compared according to lesion type and histopathologic factors. Am J Roentgenol 2011;196:1450-6. 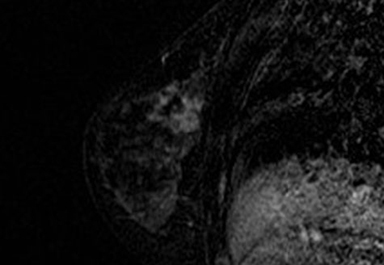 Rosen EL, Smith-Foley SA, De Martini WB, et al.. Bl-RADS MRI en-hancement characteristics of ductal carcinoma in situ. Breast J 2007;13:545-550. Jansen SA, Newstead GM, Abe H, Shimauchi et al. Pure ductal carcinoma in situ: kinetic and morphologic MR characteristics compared with mammographic appearance and nuclear grade. Radiology 2007; 245: 684-91. Morakkabati-Spitz N, Leutner C, Schild H, et al. 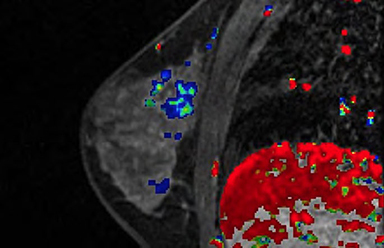 Diagnostic usefulness of segmental and linear enhancement in dynamic breast MRI. Eur RadioI 2005;15:2010-7. Neubauer H, Li M, Kuehne-Heid R, et al. High grade and non high grade ductal carcinoma in situ on dynamic MR mammography: characteristic findings for signal increase and morphological pattern of enhancement. Br J Radiol 2003;76:3-12. Viehweg P, Lampe D, Buchmann J, et al. 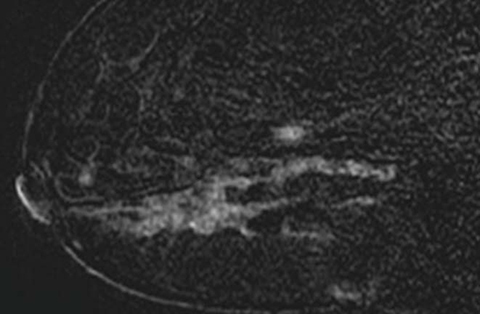 In situ and minimally invasive breast cancer: morphologic and kinetic features on contrast-enhanced MR imaging. MAGMA 2000;11:129-37. Groves AM, Warren RM, Godward S, et al. Characterization of pure high-grade DCIS on magnetic resonance imaging using the evolving breast MR lexicon terminology: can it be differentiated from pure invasive disease? Magn Reson Imaging. 2005Jul;23(6):733-8. Ballard LJ, Ballard GR. 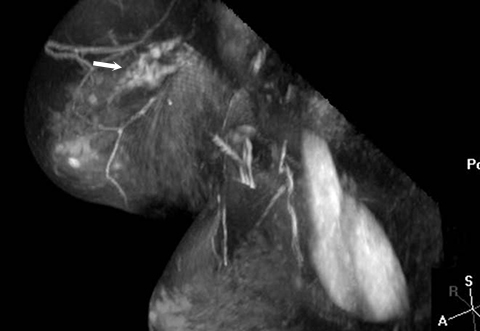 High‐Grade Ductal Carcinoma In Situ: An Overview for the Radiologist. J Am Osteopath Coll Radiol. 2013;2(1):18-25. Luke J. Ballard, M.D. and Geneva R. Ballard M.D. Dr. Luke J. Ballard works with the Division of Breast Imaging, Wilford Hall Ambulatory Surgical Center, San Antonio, TX and Dr. Geneva R. Ballard works with the Department of Radiology, San Antonio Military Medical Center, San Antonio, TX.